Smartphones and tablets are vital business tools for Square sellers, but that doesn’t mean that they no longer rely on their computers. For back-office operations, as well as access to tools not available on mobile, computers remain the most vital piece of kit for business owners. So we’re making the PC even more powerful and launching a new way for UK businesses to accept payments with Square — Virtual Terminal. Virtual Terminal gives sellers the ability to accept payments directly from their web browser on Square Dashboard. If you’re manually typing in a transaction, you no longer need a separate device to process the payment — simply log in to your Dashboard, enter the details and the payment will be complete in seconds. Sellers from all different industries like accountants, contractors, charities and health and beauty professionals can now see and run their entire business on a computer. Virtual Terminal was built using seller feedback. It’s designed to extend our fully featured ecosystem of tools empowering sellers to accept every payment, including Square Reader for face-to-face card acceptance, Square Invoices for billing customers and Square API integrations for E-Commerce. - No need for extra devices: Accept mail order, telephone and business payments quickly and securely from your web browser or Dashboard. - Send digital receipts: Personalise your digital receipt and send via SMS or email. - Empower your workforce: Enable employees to accept Square payments from their mobile devices or laptops while they’re on the road, without investing in new hardware. 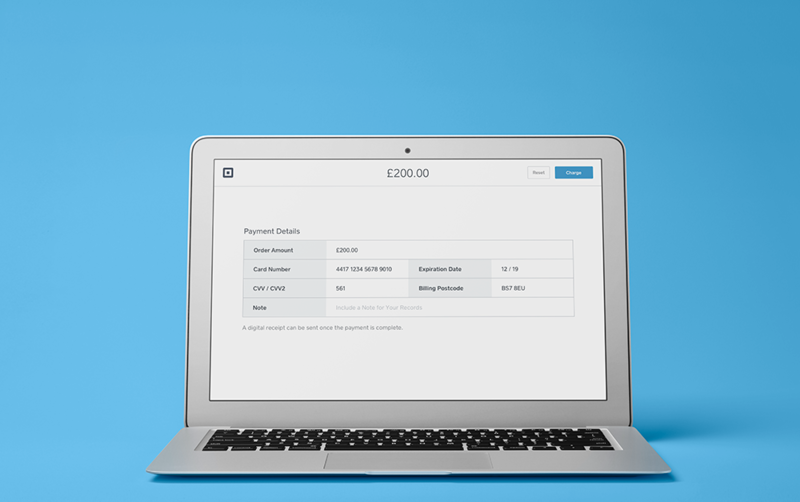 - See every payment: Track all payments alongside those made with Square Reader in your Dashboard. Virtual Terminal transactions are charged at 2.5% per transaction for any Visa, MasterCard or American Express credit or debit card. Learn more about Virtual Terminal.